A good management makes life much easier. 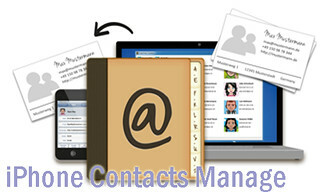 As an iPhone user, have you ever thought to manage your contacts? Did you still think manage contacts is just a simple creation or edit? Actually, what you can do is far more than these. Do not hesitate, start to try more wonderful iPhone contacts manage tips. When you found more than one duplicate contacts on your iPhone 5 address book, what would you do? Finding the duplicate contacts and delete one of them? If you know how to merge duplicate contacts, you will find how much time wasted on the past practice. To merge duplicate contacts, first of all, select a duplicate contact in your list. Tap “Edit” and scroll to the bottom of the screen and hit on “Link Contact.” Then you can choose the contact you would like to merge the other contact with. Grouping makes contacts become clearer. Do you wish to divide your contacts into Relatives, Friends and Business associates etc? Do not want to apply manager app? Well, iPhone contacts manage free tip for you. You just need to log into your iCloud account. View “All Contacts” and click on the red ribbon groups icon at the top of the screen. Then click the + button to create a new group and assign a name to the group. After doing that, go back to “All Contacts” and drag and drop a contact from the list into new group folder on the left. The new contact groups should automatically sync to your iPhone and you can view them by visiting the Contacts app. Be afraid of all the contacts in iPhone will be lost one day because accidental delete or other unexpected iPhone breakage that you want to backup your iPhone contacts. Backup contact with iTunes is the most common way. The final step performs a manual backup with iTunes and stores that backup on the local computer. How easily to manage iPhone contacts on computer, right? It is impossible to transfer iPhone contacts to PC with simple “Copy” & “Paste”, and the iTunes backup files are also invisible. It is possible to print iPhone contacts? As long as you have Tenorshare iPhone Data Recovery program, you can print contacts from iPhone 3GS, iPhone 4, iPhone 4S, iPhone 5 or other models easily on your computer. Different from iTunes, Tenorshare allow you to directly export contacts from iPhone as a viewable and printable file, so that you can print it without any modification. Surprise to see we can do so much to manage iPhone contacts? Start to enjoy these wonderful tips! This entry was posted in Tips for iPhone Contacts and tagged iPhone contacts manage, iPhone contacts manage free, manage iPhone contacts, manage iPhone contacts on computer on April 18, 2013 by Jack.